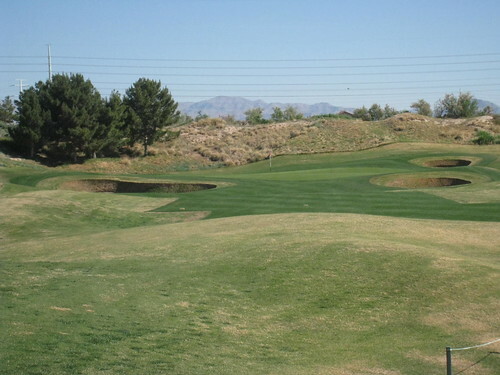 I was attending a conference in Vegas and asked if I would like to play Royal Links. You can guess what my answer was. 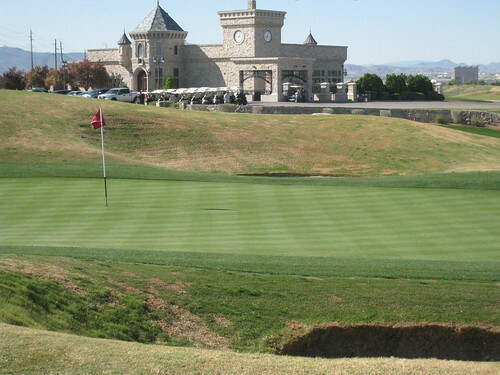 The only thing I had heard about Royal Links was that it was so tough that they wouldn’t/couldn’t give it a slope rating. 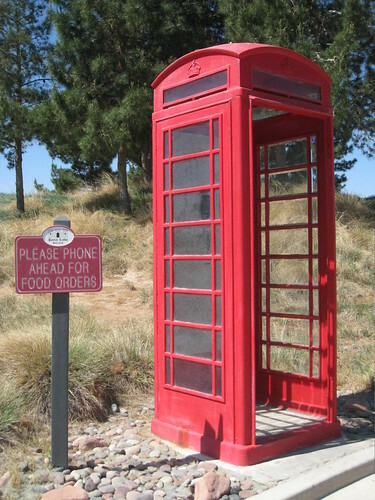 Because of all the bunkering the number was just too high. After playing it, I see what they meant. I proudly shot a 94. 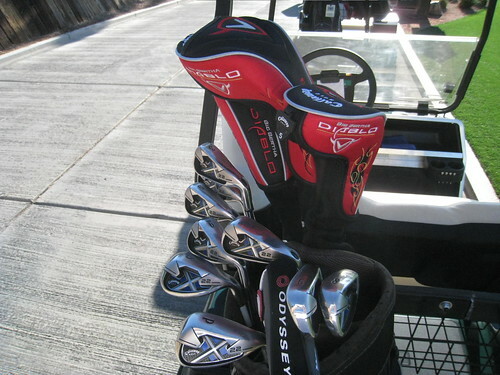 It was my first round of the year, AND I was using rental clubs, although they were very nice. The woods were the new Callaway Diablo’s, the irons were Callaway X-22’s and the putter was an Odyssey blade. All in all, very nice set of rentals. Each hole on the golf course is “inspired by” a famous golf hole from various courses that have hosted Open Championships. 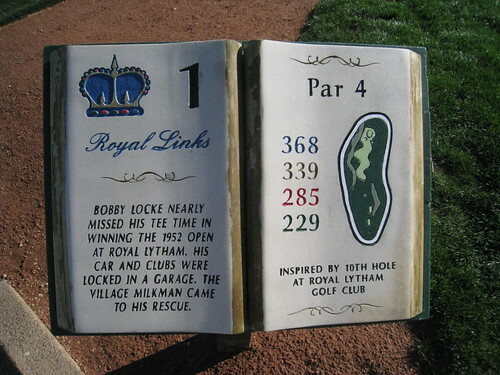 The first hole was inspired by #10 at Royal Lytham Golf Club. Each tee showed what the hole looked like (duh), listed a short story, and noted which famous hole it was designed from. 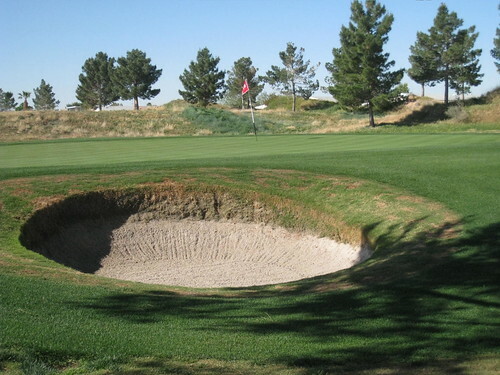 As I said, the bunkers are what really set this course apart from any others, especially in Vegas. 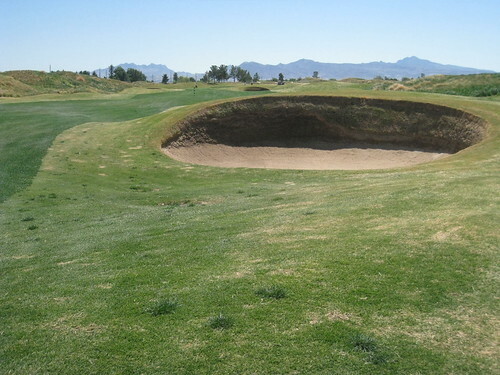 The third hole was inspired by the 2nd hole at Prestwick. 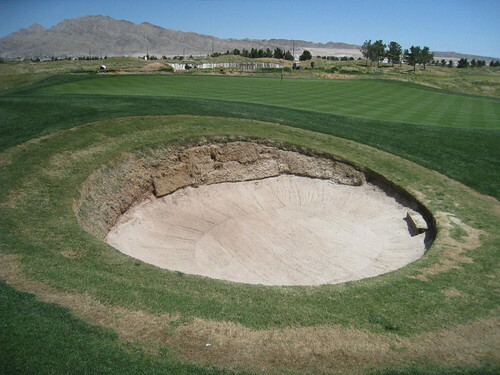 It’s a 146 yard par 3, and even from the tee you can tell the bunkers are significant. 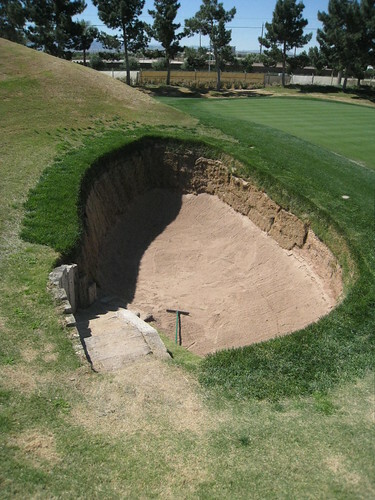 Once you get closer, you can see that a lot of the bunkers actually have steps to enter them. Like I said… significant. The fourth hole (inspired by the 8th at Royal Liverpool) is a par 5 that only has one bunker on the entire hole, located in front of the green. 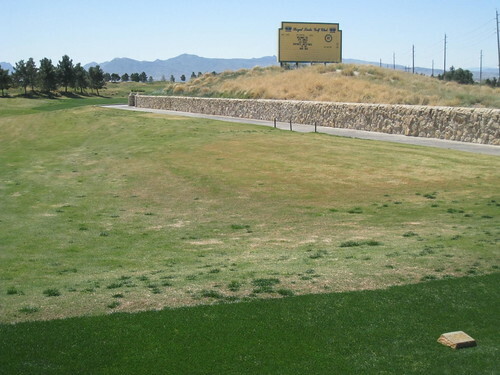 The real difficulty here is the slope of the fairway itself; it’s like an elephant burial ground. 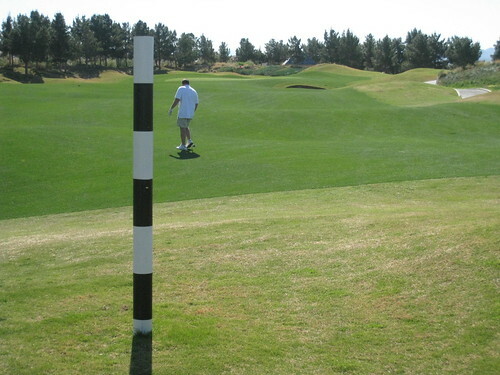 The odds of getting a flat lie, even with a perfect drive are heavily stacked against you. The 5th (inspired by the 12th at St. Andrews Old Course) is only 303 from the Gold Tees. Obviously it’s all about the bunkering, with 5 of them dispersed throughout the fairway. In addition this fairway doesn’t have a flat lie on it anywhere. 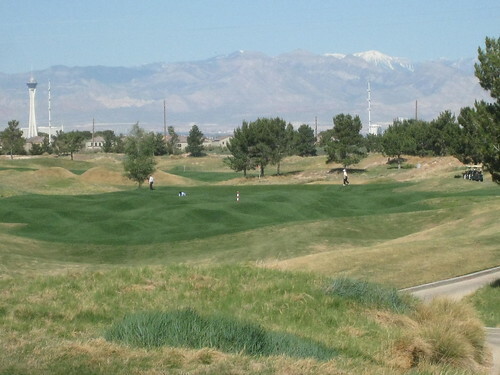 I will say that it provides a great view of the top of the Stratosphere, and the snow on the mountains. 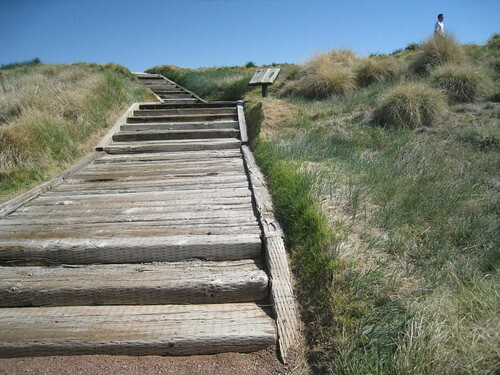 The steps up to the eighth (inspired by the “Postage Stamp”, the 8th hole at Royal Troon) made for a great picture, in my opinion. This was easily one of my favorites, and one I had been looking forward to. I remember the coverage this hole got when the Open was last played at Royal Troon; it played so difficult, I just couldn’t understand why… until I played it. Luckily I hit the right edge of the green, and it didn’t trickle into a bunker. I chipped short and 2-putted for a bogey, but I was happy with that. 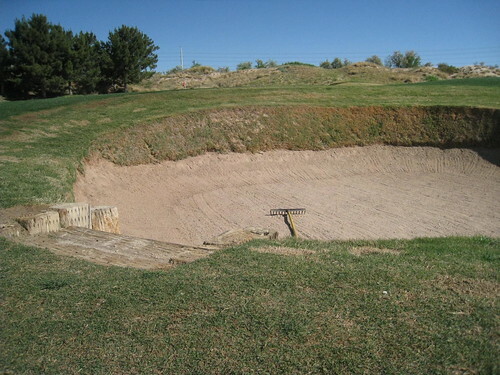 Take a look at the left greenside bunker. There are 6 steps going down into this pit. When in doubt; bail right. This thing is so deep the picture doesn’t do it justice. Between the eighth green and ninth tee you can order ahead from the grill. Nice setup here. I’ve seen one like this before at Atunyote in Verona, New York. The 10th is the Road Hole (17th at St. Andrews Old Course). What was surprising was the difficulty of the tee shot. If you don’t have a fade, forget it. Use a 5-wood and turn it into a personal par 5. 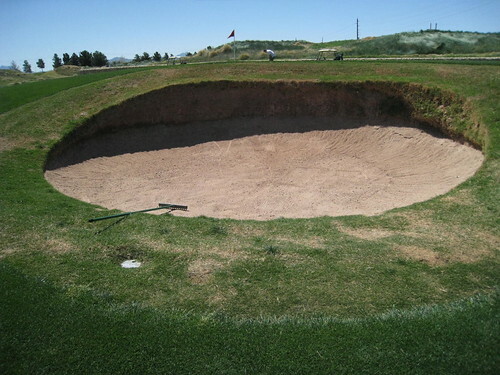 Of course, I had to take a shot out of the Road Hole bunker. True to form, it’s as difficult as it looks on TV. Regardless, it forces you to spend money in the pro shop, so from a pure marketing standpoint, it’s borderline genius. My two playing partners both bet $20 and both missed; I bet $50 and stuck it to 10 feet AND drained the birdie putt! $100 bones in the pro shop baby! Of course, in Vegas, $100 only goes so far, but still it was pretty sweet. If you blow this picture up, you can see where I putt from to make the birdie. I was having a decent round (actually really good for the first round of the year), until I reached the 16th. Inspired by the 15th at Carnoustie, it’s a 438 yard par-4 from the Gold Tees. My tee shot was a slight fade, and looked like it should end in the fairway. Unfortunately, it rolled into the fairway bunker on the right, and it took 3 shots to get out. I ended the hole with a 9. Damn. 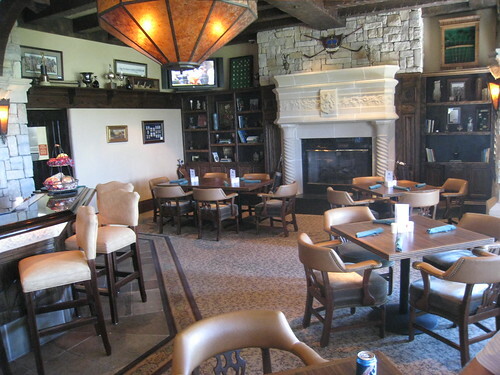 After our round we stopped in the clubhouse for lunch. 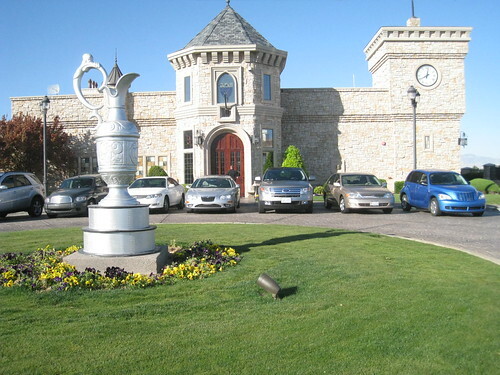 All in all, I had a really good experience at Royal Links Golf Club. If you’re any sort of historian/fan of the Open Championship you’ll undoubtedly remember some of these holes, and get that much more enjoyment out of them. 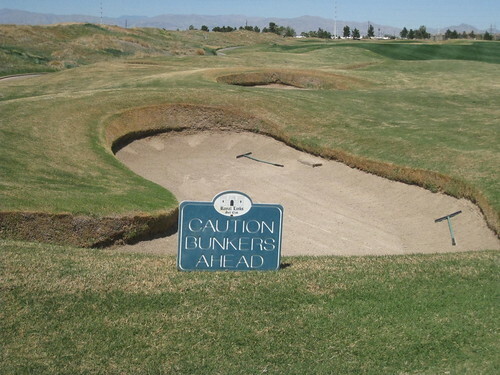 Be sure to bring a good sand game; the bunkers are almost impossible to avoid.